Register Log In Britbike forum Forums Bsa bulletin board B25 Fork internal upgrade. Hi all. I want to upgrade the internals of the 1970 b25 fork, but would like to keep the stock appearance. Is there a kit available? If not, give me your tips and tricks! I’m looking for something that won’t dive under braking, and is a bit more sporty! Is this as simple as a spring rate change? Or is there more to it? I am not familiar with the internals of these but how fast it compresses is damping, how far is spring. Hey DMagidan! I’ve got that part! I come from downhill bicycle racing where suspension setup was everything. I’m looking to upgrade my rear shocks ASAP, but would like to focus on my fork. Is anyone making a kit that allows me to adjust compression dampening, rebound, rebound dampening etc on the fly using click dials in the top of the stanchion? I’ve searched everywhere with no luck, but hoping someone here has a hidden gem I haven’t seen! That wont help the brake dive, speak to "Kommando" about dampers. use the PM.He sorted out my 71 A65 forks with trick dampers, Hi and Low speed. Last edited by gavin eisler; 02/02/19 12:30 am. Your springs are probably old and saggy, also due in 70 they switched to a lighter spring due to complaints about too stiff a spring. I prefer the weaker spring but not an old saggy one. On the damping go for a thicker oil to increase damping, that will still leave you with the issue of the valve giving no damping during its movement from compression to rebound and back. You feel this as a vague feeling on flat roads as the valves repeatedly moved position but not enough to start damping. Only cure to that is completely different internals. My 68’ forks are different as they have damper rods, but I rebuilt them completely and changed everything inside also fitted progressive springs and the change was night and day. I tried a few different type of dampers before and all helped but non were as good as it is now. Before i had to shift my weight off the front wheel when going over speed bumps to reduce the pogo effect, now it glides over them. As the actual damper rod wasn’t available to buy and mine was all pitted from corrosion. I bought some drill rod and turned them to size on the lathe. For the rears I fitted NJB ultimate shocks. Far superior to the Hagons for a similar cost. 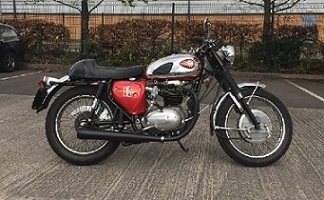 Back to topic though, I’ve ridden an A65 with the later triumph shocks and they were pretty sweet (same on a rocket 3 were not so and dived under braking) so possibly just a rebuild with some decent springs would sort our problem. Kommando, that’s what I want to do. Get all new internals. And Alan, that’s fantastic!thats exactly what i want to do, but i don’t have a lathe to turn my own rods. Would like to pick both your brains on something I can put together to make my front end fantastic. I’m going to definitely be adding a heavier weight oil to the fork, but I want new springs, dampening rods etc. Basically I would like a racier setup to make it corner nicer, as well as being able to handle low speed bumps (speed bumps in parking lots etc), better. I want more tyre contact to the pavement basically. You cannot have both racier at speed (high damping force at low speed fork defections) and being able to handle large bumps at slow speeds (low damping force at high speed deflections) without going for modern shim stacked cartridge inserts. None are available off the shelf and you need access to a lathe and precision bore steel tube to adapt them to fit. Otherwise you can only choose racier or supermarket bumps and optimise for one. The <68 type on mine uses the rods which yours won’t use. However the triumph forms which yours should have work really well when built properly. Kommando knows a lot about shocks so I wouldn’t take anything he says with a pinch of salt, with mine I just rebuilt everything with a keen eye. The progressive fork springs were a good buy in my opinion and I think help with the varied deflection high and low. But as long as you have them so they are pretty smooth on the road, the rest is down to riding, it’ll never handle like a modern bike but that’s most of the fun. That is absolutely half the fun of it!!! I think I’m going to do progressive springs, a heavier weight oil, and trial and error it as much as I can. Will be my project next weekend!!! And I agree about Kommando. I don’t take anything he says lightly. I’m here to learn, and I know when to shut my trap and listen! Both the BSA rod damper and Triumph's shuttle valve achieve the same end result but with different parts, they both suffer from no damping when moving between the 2 positions. The valves 2 positions giving 2 different damping rates, you can change the damping rates by using different viscosity oil which will affect both rates equally or you can change the holes/clearances on one valve position to change that damping rate alone. First however you need to set your static sag, so with you on the bike and off the center stand the front suspension should only use up 1/6 of it, more than that and you risk bottoming out. Plastic drain pipe makes a good spacer to increase the preload on the spring and decrease the sag.